Students, professors, staff members, and their families brought their blankets and festive spirits to the soccer field last Friday for a picnic and interactive games. The weather was perfect for the picnic that was sponsored by the Student Senate. The fun began with rounds of potato sack races, which were followed by a few competitive games of tug-of-war. 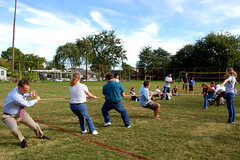 Some staff members gathered in teams and competed against each other. Dave Lightenberg, the men’s Resident Director, stated, “The bad guys – Justin Bleeker, Tina and Allan Boss, and Captain [Halvorson] – got a quick start and almost beat us, but the good guys – Dr. Aaron Belz, Max Belz, Ruby Sneider, and myself – through pure tenacity and exceptional upper body strength took it all back. Upset of the century!” Justin Bleeker, Director of Student Life, claimed that his team lost because the president of the college, Dr. Halvorson, was wearing dress shoes and his feet slipped. Students then broke into groups to enjoy some free time tossing around Frisbees, playing volleyball, or relaxing on their blankets and talking with friends. Many students including Josh Dykstra and Tim Vander Meulen along with Admissions Counselor, Max Belz, had the pleasure of playing Bocce Ball with Dr. Halvorson. 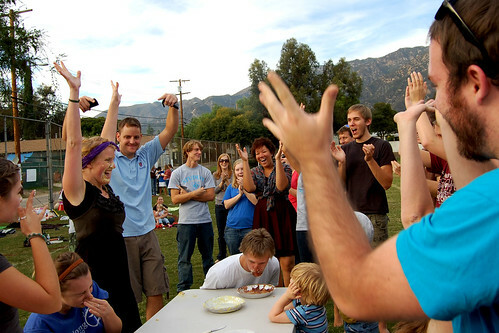 After a very close game and some disagreements about the rules, the five joined everyone else at the picnic and gathered around to watch a pie eating contest. Three men and five women dove into delicious pudding pies and raced to be the first to finish. The contest began very intensely as Evelyn Vane and Vaan Huyhn ate at an almost simultaneous speed. Near the end, Vaan had to drop out because of a bloody nose and Evelyn won the contest. “I feel awesome!” she said afterwards. “I’m not even full! I’m also very shocked at how little the boys ate! When I got done, they were only half way finished.” A mini-pie eating contest for the children followed this one and Banks Halvorson, son of Dr. Halvorson, beat all of his young opponents. After a few hours of physical activities and games, a delicious picnic dinner of hamburgers, hotdogs, potato salad, water melon and chips were enjoyed by everyone at the gathering. With a soccer field now available to Providence students at the William Carey campus, the hope is that days like these will be more frequent. Resident Assistant Marie Bosma said, “It was a fantastic idea and should be a tradition at Providence. Playing games with your fellow classmates is great! I enjoyed the competition and being placed in random teams with people. It unites us.” Shelli Cammenga, a sophomore who helped plan the event as a member of student senate, agreed. “It is so rewarding to see the community come together and connect at an event like this. It was a relaxing and fun way to spend time with friends, staff, faculty and their families!” Warm weather, great games, and delicious food with exceptional friends made for a wonderful evening.